Employees of the Ministry of land and property of the Republic of Tatarstan have taken active part in a running "the Ski track of Russia – 2018"
On February 10, 2018 the traditional All-Russian ski race "the Ski track of Russia – 2018" started in Kazan. The mass ski running has taken place on three platforms: in Gorkinsko –Ometyevsky forest park, in a flood plain of the river of the Kazanka down the street Gavrilova and at Lokomotiv stadium in the settlement of Yudino. 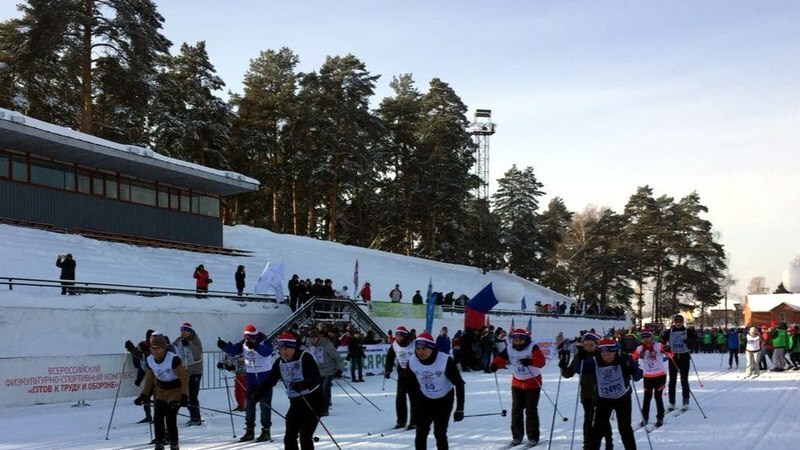 Staff of the Ministry of land and property of the Republic of Tatarstan, as always, has taken active part in the All-Russian ski running which passed across the whole country for the 36th time. By the decision of the Council on Personnel Policy under the President of the Republic of Tatarstan, the list of civil servants of the Republic of Tatarstan was approved for entry on the Electronic Board of Honor of the Republic of Tatarstan. The main purpose of its creation is to increase the prestige of the civil service of the Republic of Tatarstan and the public recognition of merit in the professional service activities of civil servants of the republic. The staff of the Ministry of land and property of the Republic of Tatarstan congratulates Guzel Nasibullina, the head of the analytical department of the department of accounting, monitoring and information interaction of the Ministry of Land and Property of the Republic of Tatarstan, and all civil servants listed on the Electronic Board of Honor of the Republic of Tatarstan, and sincerely wishes them continued success in the service . Within ten working days, the information will be posted in the appropriate information section on the official portal of the Republic of Tatarstan on the Internet information and telecommunications network http://gossluzhba.tatarstan.ru/doska-pocheta. On March 2019, the State Budget Institution "Republican Property Treasury" conducted an audit of the effective use and preservation of state property located in Zelenodolsky and Laishevsky, Vysokogorsky municipal districts of the Republic of Tatarstan, enshrined in the operational management of institutions under the Ministry of Education and Science of the Republic of Tatarstan, the Ministry of Labor, Employment and Social Protection of the Republic of Tatarstan. According to the results of the inspection of state institutions, relevant acts were drawn up with an indication of the violations found. Reports of institutions on the elimination of comments will be brought to the attention of the Ministry of Land and Property of the Republic of Tatarstan within one month. On March 25, 2019, a meeting under the chairmanship of First Deputy Minister Artur Galiyev on the issue of seizure of land for work related to subsoil use was held at the Ministry of Land and Property of the Republic of Tatarstan. The representatives of the Cabinet of Ministers of the Republic of Tatarstan, the Prosecutor’s Office of the Republic of Tatarstan, the Ministry of Justice of the Republic of Tatarstan, the Ministry of Ecology of the Republic of Tatarstan took part in discussing this issue. As part of this meeting, the problematic issues of land acquisition for state needs in order to carry out work related to the use of subsoil resources, as well as possible solutions to them, were considered. On March 26, 2019, the Minister of Land and Property of the Republic of Tatarstan, Azat Khamaev held a meeting with representatives of the Ministry of Economy of the Republic of Tatarstan, the Ministry of Justice of the Republic of Tatarstan, the Ministry of Agriculture and Food of the Republic of Tatarstan, the Ministry of Construction, Architecture and Housing and Communal Services of the Republic of Tatarstan, the Association “ Council of municipalities of the Republic of Tatarstan ", SBI" Spatial data Foundation of the Republic of Tatarstan "on the issue of the procedure for the participation of the owner of the land plot included in the boundaries of the settlement in the creation of infrastructure. The Government of the Republic of Tatarstan has been instructed to develop a procedure for the participation of the investor in the creation of infrastructure on land plots included in the boundaries of settlements. It is proposed to consider the practice of the Moscow region on charging fees for changing the types of permitted use of land for channeling funds for infrastructure development. The meeting addressed the following issues: - combining all procedures for the development of urban planning documentation for the integrated development of the territory; - reduction of unreasonable reduction of agricultural land; - preliminary approval of the inclusion of land in the borders of settlements within a single collegial body in the field of urban planning policy.